From Doctor George U. Macnamara, Corofin, Co. Clare. It is not exactly known when this church was built. It is a solid well-built structure, with late Gothic doorways, and windows. It is almost certain that it was built by one of that branch of the O’Briens who lived at Inchiquin Castle, viz., the Earls of Inchiquin, afterwards Earls, and subsequently Marquises of Thomond, now extinct. In the year 1735 Thomas MacGorman, who lived in or near the Castle of Inchiquin, built a small mortuary chapel against the eastern gable of the church. It was richly ornamented with cut stones, a few of which and some of the foundations only now remaining, and measured on the outside 17½ feet from east to west by 17 feet from north to south. At present it is almost impossible to make out these foundations. This Thomas MacGorman was a lineal descendant of Daire Bairache, King of Hy Bairche in the 2nd century, who had a son and a daughter. From the son Mahon are descended the O’Gormans of Kilrush, lately represented by Nicholas Smith O’Gorman, High Sheriff of Clare, 1878. From the daughter Mary are descended the Macnamaras of Corofin, who now used the site of the little chapel as a burying-place. 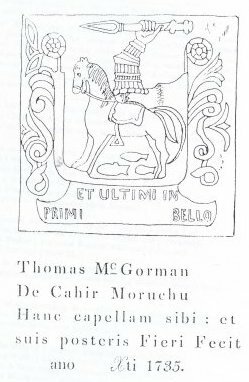 Thomas MacGorman (whose descendants changed their name to O’Gorman) came from Caher Moraghue in West Clare, and settled down in Inchiquin some time before he built the mortuary chapel. He was married first to Alicia O’Dempsey, the daughter of Lieutenant-Colonel Terence O’Dempsey, brother of Maximilian, 3rd and last Lord of Clanmalier. By this wife he had an only son and daughter, as above stated. His 2nd wife was Judith, daughter of Captain William Wolverton of Co. Westmeath, and his 3rd wife was Mary Mac Geoghegan, of Donore, in the same County. As far as is known, he had no family by either his 2nd or last wife. The two oldest graves in Coad are the Power and O’Brien graves. The latter was erected to the two daughters of Conor O’Brien of Leimaneagh, and his wife Maurian Roe. (See inscription, below.) The Power tombstone was erected to the memory of Ellinor Creagh, who died 22nd April 1673, daughter of John Creagh Fitzwilliam, Alderman of Limerick, and wife of Dominick Power of Corofin. He was the first of this family who settled at Corofin. Both these graves are immediately under the east window, inside the church, and side by side. East of preceding is a rough flag, the name “IOHN OHAWE” on top, at left-hand corner. Inside the church, under east window, on site of altar, are the two following tombs side by side, the O’Brien tomb being to the south. Mary, wife of Conor O’Brien, is the amazonian “Maureen Rhue,” equally notorious in tradition and the depositions of the plundered English settlers; her portrait remains at Ennistymon, in possession of H. V. Macnamara, Esq. The date is hard to be read, and may possibly be 1681. They were sisters of Sir Donough O’Brien of Liemaneagh, on whom was conferred the Baronetey, and daughters of Conor O’Brien of Leimaneagh and Maurice Roe McMahon. I have heard it said that their remains were transferred to Kilnasoola when the new tomb was made in that church. The above Dominick Power got, by deed dated 23rd of May, 1684 (a copy of which is still extant), the right to erect this tomb from Moragh, 1st Earl of Inchiquin. Another slab, inside the church, has a plain Latin cross, the three arms ending in rings. “This Flag was erected | by PATK. FITZGERALD | in memory of his wife | MARY FITZGERALD | als. DAVOREN who | Deped. this life August. | 28th 1802 aged 48 | yrs. This Mrs. Spellissy was sister of the celebrated Rev. John Murphy, P.P., of Corofin, who took such an important part in the return of Daniel O’Connell as M.P. for Clare. “Erected | by Mr. PATRICK SPELLISSY to the | memory of his stepmother ALICIA | SPELLISSY alias HEYNES the wife of | Mr. JAMES SPELLISSY of Corofin | she departed this life in the year | of our Lord 1825 aged 42 yrs. and | also to the memory of her son | MICHAEL SPELLISSY who died in | the year 1853 aged 36 yrs. The above inscription is nearly worn away, and in a very short time cannot be read. Margery Wolverton was probably daughter of a captain William Wolverston (or Wolverton), whose wife, Marcella McGeoghegan, of Donore, Co. Westmeath, was aunt of the first wife of Thomas McGorman, who built, in the year 1735, the small chapel once existing at the east end of the church. There are, except the mere foundations, only two carved stones remaining of this chapel, a sketch of the larger one, drawn by Mr. Thos. J. Westropp, M.R.I.A., I here append. Caher Moragha [Cahermurphy] is in West Clare. MCGORMAN (a sept derived from Cathair Mor, King of Leinster, who inhabited the territory of Hy Bairche in the Queen’s County and County Carlow, from which they were driven after the invasion of 1172, and settled under the O’Briens in the Barony of Ibrickan, in Thomond; they derived their surname from Gormain, Chief of the Sept). Arms—Azure, a lion pass. betw. three swords erect ar. Crest—An arm embowed in armour grasping in the hand a sword, blade wavy, all ppr. This latter Michael was grandfather of the John Macnamara whose inscription is given above. The tomb in Quin Abbey was barbarously mutilated some years ago to make room for the hideous vault built for Rev. Dr. M‘Mahon, but quite enough of the inscription remains to identify it. The stonecutter made several blunders in the spelling, but English schoolmasters were scarce in Thomond in those days, Irish being still the language of the country. East of the tomb of John Macnamara, but outside the foundations of the MacGorman Chapel, is a very curious tombstone. Soon or late must come this way. The Heraldry in above tombstone is very bad. The correct crest is a stag’s head erased holding an arrow point in base, in its mouth. Contributed by Thomas J. Westropp Esq. FOSTER— 1761. PATRICK, of Baunkyle. Arms—3 stags’ heads (impaling a stag salient). FOSTER— 1786. ROBERT, of Kells. Crest—A stag trippant. MACGORMAN— 1735. THOMAS, of Cahirmoroghu (Cahermurphy). Arms—A horse bridled and saddled, below are 3 fishes naiant. 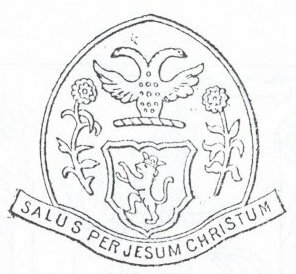 Crest—A hand and arm vambraced holding a spear. Motto—PROBATA EST OPTIMA VIRTUS. O’DAVOREN—1822. Here inserted as a record of the Arms of a noteworthy old family, of which I could find no old example Armorial bearings of Rev. MICHAEL DAVOREN. O’NELLANE—, 1645. DERMOT. Arms concealed by an incrustation. O’BRIEN— 1641. CONOR O’BRIEN, parish of Kilnaboy, Co. Clare. The shields are those of Capt. CONOR O’BRIEN, of Lemenagh, husband of the traditionally famous “Maureen Rhue,” and of Sir DONOUGH O’BRIEN, Bart., son of the last. Fully quartered. Arms—1 and 4, three lions passant in pale; 2, three piles; 3, a pheon. Crest—Hand, arm, and dagger. Sir DONAT, 1684. Arms—Three lions passant in pale. From Doctor G. N. Macnamara. 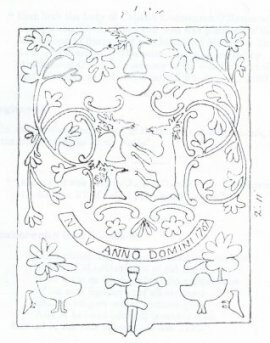 The accompanying Plate represents the western part of the Foster of Bankyle Tomb in the graveyard of the Church of Coad, parish of Kilnaboy. See [above] for the inscription, &c., which is now barely legible. From F. Weldon Walche, 1892. Lies Terry O’Flanagan, body and bones. From T. J. Westropp, M.A. There are only four monuments in this church worthy of notice. * This inscription appears, inaccurately given, on p. 230, Vol. VI. of The Journal. LOUGHLIN REAGH O’HEHIRS TOMB, FINISHED BY HIS SON ANDREW O’HEHIR 1711. The name Kilnaboy is a corrupt form of the Irish Cill-inghen-Baoith, meaning “the church of the daughter of Bœthius.” The patron-saint’s day was kept on the 29th of December; and her well, close by, is resorted to for the cure of sore eyes.